NHC talks to Gary Moat (ex Heavy Pettin') about his superb new band Burnt Out Wreck. Scottish rock fans of a certain age will fondly (or otherwise) remember Heavy Pettin', a larger than life band from the 80's that shone incredibly brightly for a few short years, but ultimately crashed and burned before the end of that decade. Fast forward almost 30 years, and there is a bit of a buzz about the band again, as they are on the comeback trail, or at least three of the original band are. Having played the Winterstorm festival, opinions are as divided about the band as they ever were. But while they indulge in the glow of nostalgia, the main songwriter and original drummer from the band, Gary Moat (not involved with the reunion), is back with his own brand new outfit, the rather excellent Burnt Out Wreck. One thing this band cannot be accused of is looking back. This is a new band for the future, and this time around, Gary is stepping out from behind the drumkit to front the band. If you haven't heard them, you might be in for a bit of a surprise - check the video link at the end of the interview. NHC's resident rocker Campbell Stewart caught up with Gary just before they went on stage for their Glasgow debut at Audio recently. CS - Let's get a little history out of the way first, Heavy Pettin ended almost 30 years ago, and I guess to most rock fans, you've been pretty much under the radar for most of that period, so what else have you been up to in a musical sense in that time? GM - Yes, after Heavy Pettin' we had Mother's Ruin with Gordon from Heavy Pettin' involved. We had both moved down to Milton Keynes and started families down there, but the band kind of fell away due to work and various other things, bass player going to Uni in Manchester, that sort of thing. After that, there wasn't much going on other than writing songs, and occasionally I'd get the chance to sing and play with covers bands now and again for a bit of fun and to keep the voice going... at one point I was in 3 bands at the same time, 2 playing drums and one singing. Then in 2013 I decided to get Mother's Ruin back on the go again, this time with our current Burnt Out Wreck guitarist Adrian. That lasted around 6 months, then once I decided that the songs I'd been writing were good enough to go on an album, I asked Adrian back to help out as he was far and away the best suited for the job, and we work great together. CS - As you mentioned, you've brought Adrian along from Mother's Ruin into Burnt Out Wreck, but how did the rest of the band fall into place? GM - Myself and Adrian had gone into the studio to record the songs, and once the album was done, everyone kept telling me we couldn't simply release it and leave it at that, because it was so good, so we decided to hurriedly put a band together. Paul from Gun suggested we try La Paz bassist Al, and although I didn't actually know him, when he turned up at my house for the first time, we just clicked as if he was one of my old mates. He's Mister Cool on stage and he just loves the straight ahead rock'n'roll style we do. Myles on guitar came from one of the other bands I'd been playing in. We could have gone with myself playing rhythm guitar and vocals, but that takes away the excitement for me. Finally we got Paul on drums, who is a drum teacher, and who if I was to be honest, is a better drummer than me (laughs). He's far more technical, so I have to hold him back a wee bit at times, and remind him we're just a solid rock band... he'd join Iron Maiden in an instant though! CS - How did the name come about? GM - We got bored with the Mother's Ruin name, too many other bands out there with that same name, and we even had one lot hassle us about it, so we needed something different. It just came to me that the state of us at our age, looking in the mirror, we were all burnt out wrecks. I Googled it, and there was no one else with that name, so that was it. CS - I know the album was recorded by just yourself and Adrian, was the plan always to build it into a proper touring band, or was it a case of 'wait and see what folk think of the album first'? GM - At the time, probably not, because as we've said, people our age with jobs and families, getting people organised isn't easy. Just getting the band together for the trip up here, getting them all to get the time off work just to come up to Glasgow wasn't straightforward. CS - People tend to forget that at this level, not everyone is a professional musician, and that's all they do, most folk have to work to support the music side of things. GM - Absolutely, we all have to live, so there's an awful lot of craziness with some comments online, folk thinking at the age of 50+, we're living in the back of a van, and if they want you to play their place tomorrow, you'll be there! CS - From what I've seen, reviews have been generally very positive about the album, and rightly so. Are you pleased with the feedback you've been getting, and would it bother you much to read something less than complimentary? GM - To be honest, I think I've only read one not so good review, and it was more for just a couple of tracks that he didn't like rather than the whole album. The rest though have been very positive, which has blown me away, because after all this time being nowhere, and putting these songs out, I love it. It's not pretentious music, just straight ahead rock'n'roll. 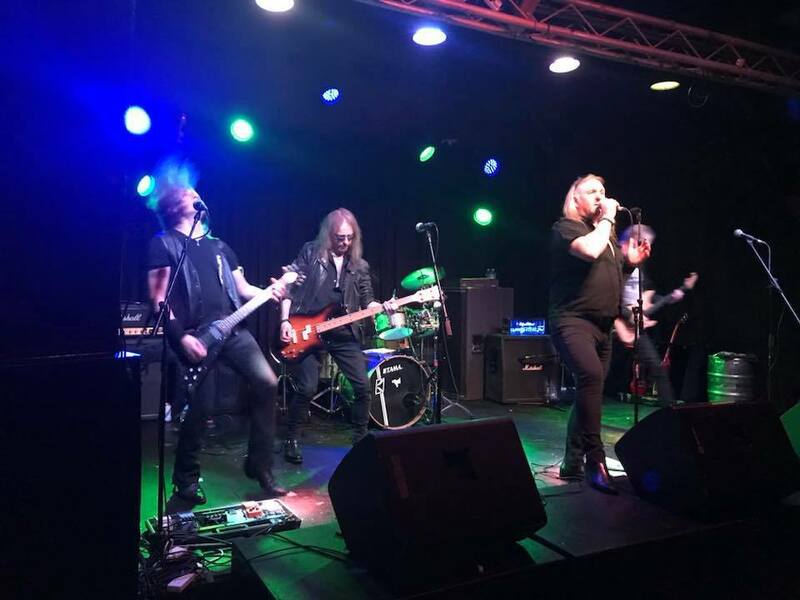 CS - There are some easy comparisons to be made with the sound of the band, particularly with your voice, with the likes of AC/DC's Bon Scott and Marc Storace of Krokus being mentioned regularly in reviews. Are those bands a big influence, and do those kind of comparisons sit well with you? GM - Oh yeah definitely, Bon Scott is the biggest influence in the world to me. I went to see AC/DC in Glasgow City Halls way back in 1976. I remember one big usher type with the big coat on, and the whole place just went potty, and this was at a time when not many people knew who they were. This usher telling folk to sit down, but the place just went mental, fans rolling their trousers up to look like Angus Young. Before all this, it had been Quo and Lizzy we were into, but this was something new altogether, we wondered what was going on, why it was affecting us in such a way. Krokus, obviously very much like AC/DC as well, and Marc has a cracking voice. I loved seeing them when they played at the Loch Lomond festival at the old bear park in 1980. So, that's the main influences, but I've been compared to a few folk with higher voices, even Noddy Holder, although one guy said he thought I sounded like Paul Rodgers, (laughs), where on earth did he get that one from!? CS - The first Burnt Out Wreck gig was at the Giants of Rock festival at the start of the year, which had quite a line up of legendary figures, and you have landed some pretty top notch support slots, with the likes of Y&T, Faster Pussycat, and more. How have those been going? GM - Just amazing really. At the Giants of Rock festival, we were first band on at 1 o'clock in the afternoon, and bearing in mind it was our first gig as this band. We'd hardly been rehearsing, as Al lives up here, and we're all down south, so there have been times where I've played either bass or rhythm guitar as well as singing at the rehearsals. But it was an amazing gig, I'd had a really bad flu, and was drinking Lemsips, and taking honey, and all sorts, coughing my guts up, yet afterwards everyone said it was bloody amazing. I guess we must have been good and folk got the general vibe about what we were trying to do. It was a good 5 months after that till we got to gig again, due to a few that got cancelled, but we've just got better with every gig, and I think we're at number 15 or 16 now. Not a lot for a full year, but we've been trying specifically to get gigs that suit us, good supports that will get us out to a decent audience. We've just done the Hard Rock Hell festival, which certainly achieved that, everyone went potty for us which was great. A kind of strange one was supporting prog rock legends Focus, at a 400 seat venue, with a captive audience of folk in their 50's to 70's, all there to see Focus of course. We were curious about how it would go, being all seated, but the place went mental for us, we had the whole place clapping and I just looked at the band and they were all like 'what the hell's happening here', so we went down really well that night. CS - Any set plans for next year for gigs? GM - yes indeed, there's a lot already on the Facebook page (link below), and we try and keep that up to date with all that's going on with the band, with the help of Claire, my manager and wife. We've applied for a few festivals around the country and over in Europe. The next Scottish dates for us won't be till next December at the moment, we'll be working our way up with Newcastle, Glasgow and Dundee, 3 nights in a row. Think they're trying to kill me off! CS - What about new material, does the songwriting process come easy to you? GM - Sort of, I do have a lot of ideas going around, and I can come up with wee bits of a tune, record it, then go back to it years later again. There are a couple of those I'll be using next, and the song Burnt Out Wreck was one of those too, just a guitar riff I'd come up with and now developed into the full song. CS - You've been in the business for quite a few years now, and will have seen so many huge changes to how it all works. If you could go back and give your younger self some advice, what would you say? GM - (pauses) Don't get into music. If you really want a basic honest answer that's what I would say. We were one of those unlucky bands in Heavy Pettin', it looked like we had everything, but we really didn't. Everyone was too busy stealing it off us, you know, so potentially we could have had a lot, but didn't. Just the usual thing, management record company, publishing, the usual kind of story you hear in rock'n'roll. CS - What can we expect from a headlining BOW show, will there be any nods back to the past, or is it all going to be new material we hear. GM - It really depends on the audience, so if we get a good enough audience that are really into it, then fine, we'll probably do 'Rock Ain't Dead' from the Heavy Pettin' days, given I wrote it originally. I wouldn't want to play any other stuff from that period, and not everyne knows the link anyway. When we played Evesham recently, we had a guy coming to see us who was travelling a fair distance, and he said he had to leave early to get home, so we were playing away, and got to the point where we started Rock Ain't Dead. It turned out he was just on his way out at that point, and came straight back in, and by the end of it he was very emotional, in tears, and that almost set me off as well. An amazing reaction, so that's what to expect from the set really.